What Is ItThe end of a railroad where it mees with a shipyard and a giant concrete building where there appears to be some kind of production going on as well as a "Mayflower" shipping truck. What Is ItAn empty clam shell on the beach. Why It's Today's PickI went for a walk on the beach at Gillis Park today. This empty clam was just sitting around enjoying the view, or at least, that's how I imagine it like it were some Pixar film. Of course, it stuck out to to me because it's a white and yellowish object among a field of browns, blacks, and greens. Now that I look at the clam closer, I can see small little bugs on it--I'm guessing they're looking to clean out any lingering reminents of the clam that used to live in the shell. And when I look even closer, there is a whole army of the buggers to the left of the clam in the bottom corner of the photo. It makes me almost wish I had seen them and tried to capture them. What Is ItA photo of a statue at the MBTA Central Station in Lynn. Why It's Today's PickI really like this statue. Clearly, we know that part of the reason is that I'm a shameless bibliophile. Of course, I also teach literature at North Shore Community College, which is right across the street from this statue. But I love what the statue communicates. The person sits upon a throne of books. They hold him up and indeed, when you look close enough, they even are a part of him. In fact, it's hard to tell where the books end and the person begins. It's a great metaphor about books and by proxy, learning. I find it also fascinating that the person is largely naked--speaking to how deeply books become a part of us--surpassing the exterior and delving into our private world. I look at this statue and I regularly wonder--which books are they that make up this person. In the past few weeks, I've talked plenty about audiobooks with regards to authors as well as my appreciation and considerations for narrators. In this feature, we are going to take a gander at the production end of audiobooks. It's clear when people pick up an audiobook they are thinking about the author and increasingly, the narrator. These are the two biggest forces that come through in audiobook productions. But the unsung heroes are the sound engineers, directors and others involved in turning the static text into a dynamic experience. They are the like the book editor who does so much labor and yet whose presence is rarely seen in the finished product. What Is ItA metal hoop in cement near Ferncroft Pond. Why It's Today's PickUpon a walk this morning, I decided to stop by Ferncroft Pond. I occasionally visit this small little nestled and rarely visited nook that's off of Ferncroft Road, down the street from North Shore Community College. It was a calm and slightly hazy morning and there was a nature-induced soundscape of birds, a slight breeze, insects chirping and even the occasional bullfrog letting one loose. I thought about snapping a photo of the pond, but then I spotted this figure in the ground and thought it could make a more powerful centerpiece to the photo. I liked how it came out overall, though if I were to take it again, I would try to have some of the water seen within middle part as this would make for an interesting balance and visual. It still turned out well. What Is ItA self of me at a coffee shop. In my last post in this series on June Is Audiobook Month, I took time to celebrate the author as the foundation for any and all audiobooks. 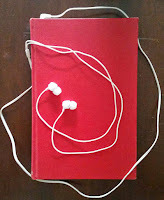 In this entry and the next entry, we are going to talk about the narrator--the life of the audiobook. I should warn you, this post is pretty much a fanboy rant about how wonderful narrators are. It will be filled with praise. The second post (next week) on narrators will have some critiques, but this post--not so much. Narrators are wonderful. They are. They take static words on a page and breathe life into them. They give color to the black and white page with their inflection and emphasis, timing and projection. The listener is passenger to a long drive filled with twists and turns, sometimes with rather challenging stretches, but the narrator brings through to the destination with apparent ease and grace. A nickel and dime on a key-ring. Why It's Today's PickYesterday, I finished the first three week intensive of the doctoral program I am in. I say "I"--but it feels awkward in my mouth. I'm inclined to say "we". We as in our cohort. The twelve students from all walks of life but all in higher education that are starting down that path to a doctoral degree together. One of us suggested we should be the Nickels & Dimes since we are "Cohort 2015" and when you put together a dime and a nickel, you get fifteen. It stuck and the same cohort member made these keychains for us. I really like this symbol that I know carry around on my keys. It represents the journey that I am on--the journey that we are on. It's an amazing and powerful adventure we're on and it's a privilege and delight to be doing it with such a great group!s So if you see the nickel and dime on my keychain--you'll know why. What Is ItAn early morning shot of the water and sunrise behind the clouds. Why It's Today's PickI found this scenery rather serene this morning. I got to UMASS Boston as the early hour of 6am. I spent some time walking around playing Ingress and taking in the calm morning. It' s the last day of a 3-week program and so to find calm waters and a rising sun seemed to capture the mental space of where I am. It's been an intense but powerful few weeks. And though it is the first leg of the journey, I feel rather optimistic about the full journey. I also liked this picture because there's such a swirling mixture of blues and grays that i can be hard to tell where one begins and another ends. This contrasts well with the mixture of yellows of the sun somewhere behind the clouds and yet still able to reflect its colors across the water. Photo Reflection of the Day #128: Which One of Us Is The Turtle? What Is ItAnother turtle that I ran into on my run today. Why It's Today's PickI was on a run today and nearly toppled over this guy (or gal--she may be looking for a place to drop some eggs). It's not the same turtle or anywhere near the last turtle I ran into and I felt obliged to take a photo. I think I needed to see the turtle on my run today. I was going for a longer run and just wasn't getting the momentum or rhythm that I wanted. I didn't expect to run fast per se (relatively speaking), but I was hoping to cover a long distance (about 15 miles). Alas, neither hope was intended. However, by seeing the turtle, it just reminded me that sometimes, slow and steady is what you need. A mile is a mile after all and if I did 11 of them, that's still good work! May was a strong month for reading for me. A lot of that credit goes to listening to audiobooks when working out--whether riding or running. And man, this month's reads were amazing. I'm recommending 3 here but in truth, most of them were excellent reads that I would encourage you to check out. And you can always see what I've rated them by clicking over to my GoodReads bookshelf. But I nailed 19 books this month and am feeling ready for a lighter reading month as I go into PhD program next week. What Is ItA dead baby bird on the concrete. What Is ItA plant growing in a neighbor's front yard. Why It's Today's PickToday's photo is another lesson in observation. over the winter when I went for a walk and into the spring, whenever I passed a neighbor's house, they had little garden box near their front porch and there looked to be pine-cones sitting in them. I figured that they just happen to coalesce there together and no one bothered to clear them out. However, while cooling down on my run home today, I happened to notice them today and realized that they are definitely not pine cones. I don't know what kind of plant they are, but they are pretty cool with their varying shades of red, orange, and green. The little hairs on them make me wonder if they are related to the species that aloe plants belong to or even cacti. But it goes to show that sometimes even if you look at something, you don't quite see it. What Is ItA picture of a lightly-clouded sky. Why It's Today's PickIt's not an amazing picture but it is a nice picture. I came outside for a walk and clearing of the head at work and just found this frame of clouds to be refreshing to look at. I think in part because I missed a lot of being outside this past week as I completed the first week of my PhD program. The ability to look up and take in a pretty sky was needed (or should have been taken of advantage of more this past week). The clouds themselves are interesting because you have the more solidly formed in the upper left corner while other clouds look more like streaks or clouds in a state of forming (or deforming). That in itself draws me into thinking about this path I have started to go down in become a PhD student and think about this picture as a transition to and from one state to another. Much of which at this point is abstract or elusive--like a cloud. What Is ItA writing challenge in class today to display significant moments of my past and how it shapes who I am today.